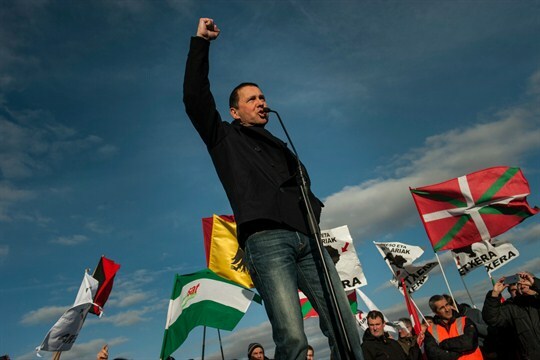 Arnaldo Otegi, a former member of ETA who is now a leader in a Basque pro-independence coalition, addresses a crowd, Logrono, Spain, March 1, 2016 (AP photo by Alvaro Barrientos). In this week’s Trend Lines podcast, WPR’s editor-in-chief, Judah Grunstein, and senior editor, Robbie Corey-Boulet, discuss the Helsinki summit between Donald Trump and Vladimir Putin and its fallout. For the Report, Raphael Tsavkko Garcia talks with Robbie about the dream of an independent Basque state in northern Spain after the formal disbanding of the violent Basque separatist group ETA earlier this year. Trend Lines was produced and edited this week by Andrew Green. You can follow him on Twitter at @_andrew_green.